The Math is the LibreOffice suite’s formula editor that enables you to use formatted mathematical and scientific formulas in a spreadsheet, presentation, drawing or text document. These formulas can include many different elements, e.g. terms with exponents and indices, fractions, integrals, mathematical functions, systems of equations, matrices, inequalities and all other elements you need. The Math can be called when it’s needed, e.g. from within the Writer or can be used as a stand alone application directly from the LibreOffice Start Center. Its formula description language is not so hard to use and learn, so you’ll be able to edit and create complex formulas with very little practice. A variety of properties and parameters for formula objects can be set using the Format menu, while the editor is open. The entered formulas can be saved in different formats, e.g .odf, PDF or MathML format. 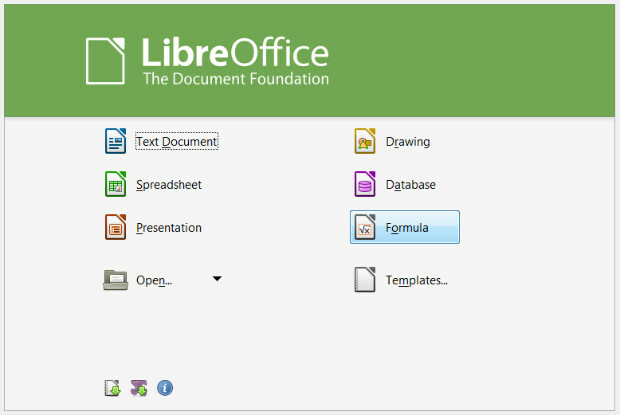 Here are some of the important LibreOffice Math capabilities and functions. 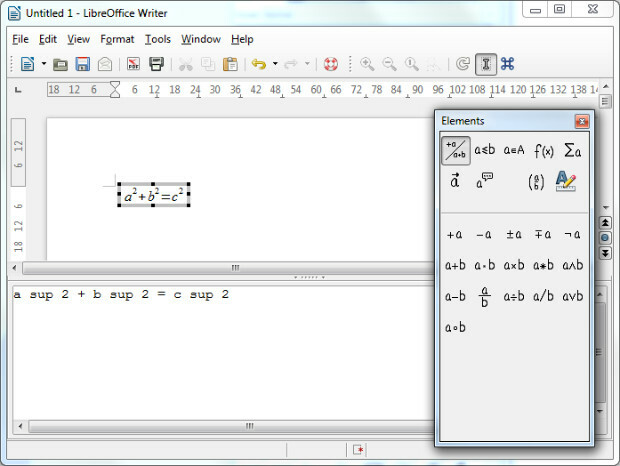 LibreOffice Math provides many different functions and operators making easier to create formulas. All of them are listed in a selection window where you can select the element in order to insert the object. Just as images, formulas are created as objects within a document and when you want to insert a formula the Math is automatically started. There are a variety of predefined functions and symbols you can use to create and edit the formula. You can also type a formula directly into the document if you know the LibreOffice Math language. Select this text and navigate to Insert -> Object -> Formula and the text will be converted into a formatted formula. Note: Formulas cannot be calculated in LibreOffice Math because it is a formula editor (for writing and showing formulas) and not a calculation program. For this purpose you need to use spreadsheets, or for simple calculations use the text document calculation function. 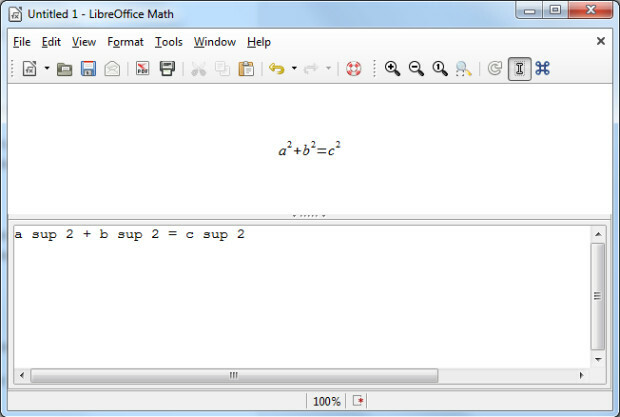 The LibreOffice Math Commands window can be used for editing and entering formulas. The results will be visible after an entry has been entered in the Commands window. In order to maintain an overview when creating long and complicated formulas, you should use the Formula Cursor on the Tools bar. When this function is activated, the cursor location within the Commands window is also shown in the text window. Another great feature is that you are free to create your own symbols and import characters from other fonts. You can add new symbols to the basic catalog of LibreOffice Math symbols, or create your own special catalogs. Numerous special characters are also available. The context menus making work with formulas easier and it can be called up with a right mouse click. The context menu has all the commands found in the Elements window, together with operators, that can be inserted into your formula by mouse-click without need to key them into the Commands window. Tips and Extended Tips provide help while you work. Tips provide you with the names of toolbar buttons. To display a tip, rest the pointer over a toolbar button until the name of the button appears. Tips are also displayed for some elements in a document, such as chapter names when you scroll through a long document. Note: Enable or disable the tips on Tools -> Options -> LibreOffice -> General. Extended tips provide a brief description about buttons and commands. To display an extended tip, press Shift+F1, then point to a button or command. Note: If you always want extended tips instead of tips, enable the extended tips on Tools -> Options -> LibreOffice -> General.